Sold by Zulay Deals and Fulfilled by Amazon. Gift-wrap available. Sold by Zulay Deals and ships from Amazon Fulfillment. 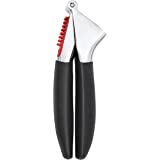 Sold by Deiss Kitchenware and ships from Amazon Fulfillment. Sold by Orblue and ships from Amazon Fulfillment. Give your hand a break. 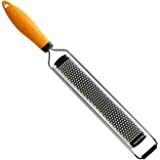 Be efficient in the kitchen with the easy-to-use Zulay Kitchen patented 2-in-1 squeezer. • Do you have an electric-powered juicer set that you never get out of the cupboard? • Are you not getting enough juice out of your limes, lemons, oranges or other fruits? Are you getting seeds in your juice? 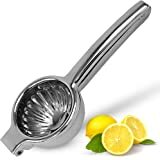 This commercial juicer maximizes yield from limes AND lemons, compare with any stainless steel lemon squeezer. 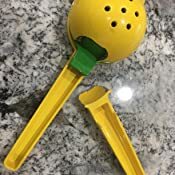 • Are you forced use a mini reamer, strainer, old fashioned tool or sprayer AND have to manually pick out pulp and seeds from your dish or drink? 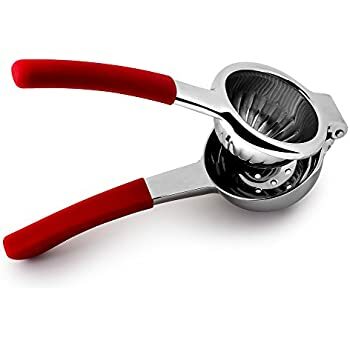 Introducing the perfectly-sized 2-in-1 manual citrus juicer aid that adapts to your needs! 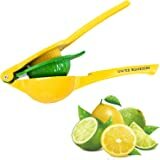 • Gets every last drop from big and small lemons, limes and small oranges (naranjas y limones). 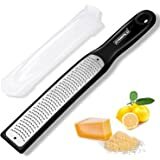 • Relieves your hands from the strain of squeezing fruits manually with just a lemon knife and your hand. • Stores easily in a utensil drawer. • Durable enough for restaurant use. 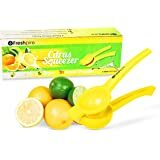 • Keeps seeds out out of your cup and maintains pulp control without separate accessories. • Cleans in seconds or can be washed in the dishwasher. Order now and take advantage of our Lifetime Money Back Guarantee, No Questions Asked. We believe in our product so much that if for any reason you aren’t fully satisfied, EMAIL US SAYING WHY and you’re all set. We will give you a full refund or free replacement. Never deal with the hassle of returning to Amazon, our family-owned house and commercial ware company is based in the USA, we respond within 24 hours and are legally licensed to sell this model. 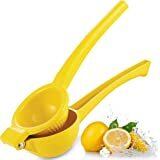 5.0 out of 5 starsLoving my new lemon squeezer! 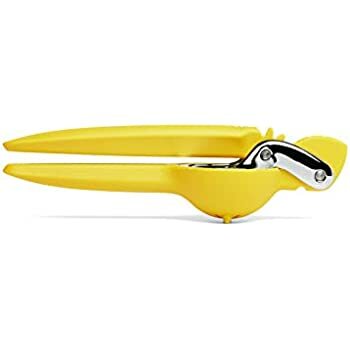 For years I've been squeezing lemons by hand, couldn't justify spending more on a real squeezer. Well, eventually after all the wet hands, lemon juice going everywhere and sore hands I just had had enough. 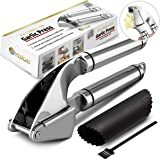 I ordered this and by far am very picky with what goes into the kitchen to avoid spending more money to replace in the future. I'm particularly considered about safety/chipping/materials. Well - I tried this out with our classic chicken piccata and it was the quickest, easiest experience and well made. 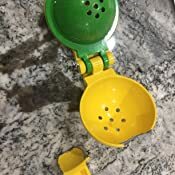 Put the lemon in, squeeze the lever, keeps all my seeds out (no more fishing!) and everytime consistent results. I saved more money getting the most juice from my lemons than probably on the product. Wish I would've bought sooner. I know this juicer has been reviewed a zillion times, but it's cool enough that I have to add to the praise. I've used a number of juicers over the years, some work great but are a pain to clean. Some work poorly or break, and those wind up in the trash. The Zulay juicer does an outstanding job with minimal effort, and is really easy to rinse off or toss in the dishwasher. 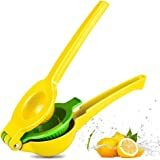 You can produce a whole bunch of "real fruit" margaritas or similar concoctions, and not wind up with sore hands from squeezing pounds of lemons and limes. I really like the ability to switch back and forth between fruit sizes without worrying about losing the "lime adapter". Something really cute and practical about the yellow & green color scheme...reminds me of that furniture store with no words in their assembly manuals:-) Great product, can't recommend it enough. 5.0 out of 5 starsMakes me happy too. I read reviews here on Amazon before buying this juicer and the one that sent me over the edge was a person who stated that it "made [them] happy." That totally made me smile and I thought: "what the heck." As a vegan, I use a lot of lemons (smoothies and guacamole) and have always used one of those old fashioned glass dish reamer juicers. 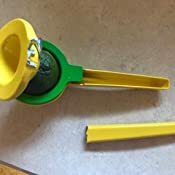 You know, one with the little seed catchers that you have to use a spoon to pick the seeds out before pouring out the juice? This little device is so cool. I used the large side first, then take the rind and put it in the small side and usually get another teaspoon of juice. No seeds to pick out and a very thorough at extracting juice. I do sorta miss the pulp, but am surprised at the ease and speed of this tool, both with juicing and then clean up. Plus, it's a sunny yellow color. I see what that other reviewer meant by it making them happy. go figure? 5.0 out of 5 starsCustomer Service is OUTSTANDING!!! I was immediately contacted by Zulay in reference to my faulty product. They advised that I had received a faulty product from a bad batch distributed by one of their suppliers. I was offered a full refund and/or a replacement and advised that this product carries a lifetime warranty. Within three days my replacement was at my door with a handwritten apology letter. It was apparent the metal used in the faulty juicer was inferior to the replacement. It's so glad to see a company that makes things right and still has OUTSTANDING customer service. I'm impressed! 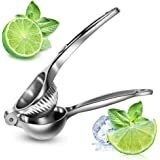 I've been using a different hand juicer -- one that is more of a generic size -- and have always been dissatisfied with how little juice it extracts from limes. this juicer solves that problem beautifully. 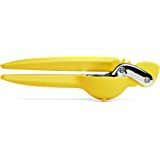 i also like that this one device squeezes lemons AND limes, so that only one squeezer is necessary for both. i'm purchasing another for our vacation house -- can't be without it! 5.0 out of 5 starsWhat's not to like? Great squuezer. I have lemon and lime trees that produce too much. I've been letting the fruit drop and rot. Decided that wasn't p.c. But didn't want to use my kitchen aid citrus attachment-too messy. 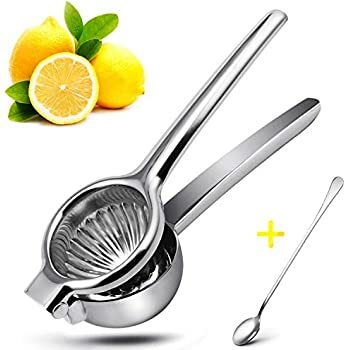 So I got this, juiced all lemons and limes that were ripe. Put juice in ice cube trays froze them and now have tons of juice for recipes, drinks etc. 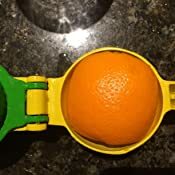 I have arthritis in my right hand so manual squeezing was hard but the configuration of this squeezer lets me squueze gently with two hands and get lots of juice- more than by any other method I've used and the cleanup is nothing. I've registered for lifetime warranty.